Please try to have a proper vocabulary , And if you do not like what you see, you are not oblivious to looking at it ,And this design is created by me. I'm sure you mean "obligated", not oblivious.. .
Great content so far i got to say. Greetings Illidari,it was released our 5th dungeon, Halls of Valor in all difficulties! first raid coming soon! Our first raid Trial of Valor has been released! Are you looking for a server? Colossus WoW Legion. A server with PvP content and PvE secured. What does Colossus offer you as a player? Colossus offers you an excellent Blizzlike gameplay experience, in addition to many game options, in Colossus you can choose your own experience rate from the web, just enter with your email and password at www.colossuswow.com, in the profile section, in the Settings tab, Personal Rates !. In addition to this, Colossus has other things for those new players. 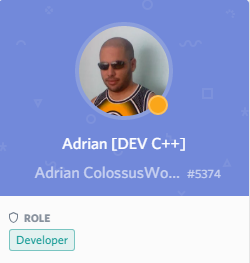 Colossus allows the option of being able to migrate your character alone or with your guild from any expansion and server. In addition to receiving a unique promo per person that allows you to have an instant 110 character equipped character with two mounts and full professions. But there is still more, Colossus has its own Loyalty system, this system allows you as a player to use Colossus shop without having to pay with real money, this system will give you points that you can use to buy each in the game. But, what good is all this if there is no content to play ...? WRONG, Colossus allows you a lot of PvP and PVE content. Including World Missions in the Legion expansion, BG, sands and much more. Five dungeons and a raid with all your difficulties are waiting for you. Do not let anyone tell you, see it with your own eyes.